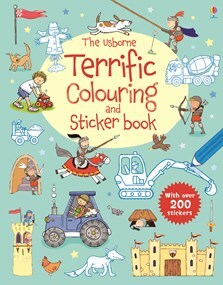 A bumper activity book, providing hours of creative fun with stickers and colouring. Little children will be occupied for hours colouring a farm at harvest time, sticking knights into place in a castle, and colouring in lots of trucks and diggers in the varied scenes. With over 200 stickers to add of tractors and diggers, knights, falconers, frogs, fireflies and more.